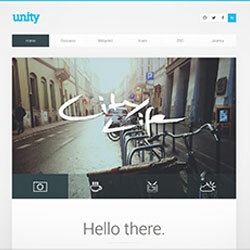 This August our new theme release Unity comes your way to bring some fresh air. Unity comes with a whole pile of cool features! The boxed style fits your content into a well organized layout. Additionally this theme comes with fullscreen header background styles that can be combined with the unique bonus style for the Widgetkit Slideshow to create an amazing look and feel. A cool Switcher enhances your site’s functionality. This theme fits perfectly for all kinds of businesses, from small to middle sized companies you will have a good start to work with. Unity's navigation has a grid of its own, so it will automatically split the main menu into equal parts and add separators between the links. On top of the special blog layout, Unity gives you total flexibility. The main navigation can be fixed optionally and you can select background colors, padding and divider options for every position. The Smooth-scroll position provides a special navigation to help you increase usability of your onepage website. Unity is based on Warp 7 and provides full support for LESS. The front-end is completely built with UIkit and can be modified through the Customizer. You can change colors, spacings and fonts without having to write a single line of code. To get you started, Unity already provides 8 different style variations to choose from.